Properties in Sofaia Waterfall average 4.6 out of 5 stars. Cottage with garden, 2 steps from the sea, for 5 people, fully equipped. Property 17: Cottage with garden, 2 steps from the sea, for 5 people, fully equipped. Amazing panoramic view, sulfur bath public bath. Property 38: Amazing panoramic view, sulfur bath public bath. COTTAGES 50 m², COMFORT, SEA VIEW, POOL AND CAR. 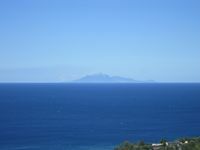 Property 47: COTTAGES 50 m², COMFORT, SEA VIEW, POOL AND CAR. Kaz la Perle is a Jewel! 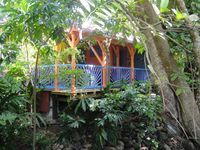 We stayed here for 16 nights and found it to be a great place to be, ideally located as a base for touring Guadeloupe and for zero mile days at the beach. Marcelle, Alain, and their son, Tommy are great hosts, giving complete privacy, yet immediately available if you need them. This is a perfect place for a couple to vacation, with or without young children. Plage la Perle is a beautiful beach and this part of Basse Terre is the best location in Guadeloupe in our opinion. Check out Ti Poisson La restaurant on the beach, the pizza place on the main road, the Kassavarie, and the nearby mini-market/bakery. The U Supermarket is nearby and Restaurant Clara in Saint Rose is not to be missed. The Kaz is well-equipped, the bed is very comfortable and the porch next to the babbling brook is great for relaxing. Highly recommended!